A combination of the Space Race and the Cold War with the Union of Soviet Socialist Republic (U.S.S.R.) in the 1950s and 1960s generated a lot of interest in rocketry - both full-scale and hobby models. The shroud of secrecy (aka the Iron Curtain) surrounding all aspects of the Communist regime served to increase the fascination with any form of technology that emerged in the public. Keeping prying eyes of of ground-based entities was difficult enough for the Ruskies, but it is nearly impossible to prevent observations of things in the air - like rockets, helicopters, and airplanes. A lot of information can be gleaned about a rocket, for instance, by its physical size and shape; exhaust temperature, chemical composition, and sound signature; flight path, etc. Military rockets were of greatest interest to the Free Worlds' (which ain't so 'free' anymore) investigators, but even models like the atmospheric sounding rocket provided clues as to the state of the art in Russia. They made good scale hobby subjects because of being unusual and rarely seen (especially in the days before the Internet). Soviet rocketry is of worldwide interest and it follows that Russian designs hold many scale modeling possibilities. The MR-1 Meteo sounding rocket is such a subject. It can be 'staged' in the model using standard American body tubes. The MR-1 Meteo: Soviet rocketry is not the secret enigma that many people in the United States think. Photographs, drawings, and performance data on a number of USSR birds have been openly published in aerospace journals and magazines. Just as Soviet aircraft do not show any obvious differences from their Western counterparts, so Soviet rockets are really quite straightforward - taking into account, of course, that some detail design philosophy differs between the East and the West. USSR rockets have a tendency to be simple, straightforward, and often over-designed. There is also a prevalent opinion in the USA that the entire Russian rocket program was stolen from the Germans and that the program still depends on captured German scientists. This is simply and categorically not true. Anyone who has taken the time to acquaint himself with Russian rocket history knows that. The Soviet rocket program depended no more on the Germans than our own program. It is a matter of recorded history that the Soviets began supporting two amateur rocket groups - one in Moscow and the other in Leningrad - in about 1919 and developed their entire rocket program from the progress of these two groups. Aeronautical historians know that the Russians flew a rocket-propelled interceptor aircraft, the Berezniak-Isaev BI-1, in 1942 and that they experimented with solid-propellant RATO units mounted on a Tupolev I-4 in 1934-1935. In addition to building ICBM's and space boosters, the USSR has also been active in the field of sounding rockets. Typical of their rocketsondes is the MR-1 "Meteo," a boosted rocket comparable in many respects to our own "Aerobee." It was developed in 1948-1949 by the Academy of Sciences of the USSR. During the IGY (1957-1958), the MR-1 Meteo was flown by the Russians from launching sites in Franz Joseph Land, in Siberia, and in the Antarctic, some 170 Meteos being flown during that period. Meteo will carry a payload of 158.5 pounds to an altitude of about 60 miles. The payload separates from the sustainer, and both sections are recovered by large square parachutes. The bird is launched from a tower. The following data on the MR-1 Meteo was obtained from the Czech magazine Letectir + Kosmonautica published in Prague in October 1965: Take-off weight: 915 kg. (2013 lb); Payload weight: 72 kg (158.5 lb. ); Overall length: 9.12 m (358.59 in); Acceleration: 9.08 g (maximum). Weight, 235 kg (517 lb), 680 kg (1496 lb); Length, 1.368 m (58.8 in), 7.0 m (275.6 in); Diameter, 0.435 m (17.12 in), 0.435 m (17.12 in); Fin span, 1.22 m (48 in), 1.22 m (48 in); Propellant, Solid, Nitric acid + gasoline. Propellant wt., 82 kg (180.5 lb), 380 kg (836 lb); Thrust, 8300 kp (18,300 lb), 1300 kp (2860 lb); Duration, 2.0 sec., 60 sec. ; Burnout velocity, 170 m/sec (558 ft/sec), 1100 m/sec (3610 ft/sec); Burnout altitude, 150-180 m (492-590 ft), 28 km (92,000 ft); Peak altitude, for sustainer - 96 km (59.6 mi). While the booster is a high-thrust solid, the sustainer engine is a pressure-fed liquid unit utilizing hypergolic propellants fed to a regeneratively - cooled thrust chamber. The rocket is a fin-stabilized free-ballistic vehicle with no guidance system, depending upon its launch tower for initial guidance and its fins for aerodynamic stabilization. The MR-1 Meteo makes an excellent subject for scale model rocketry, since its dimensions are such that it can be staged using the taped-engine technique that we must follow to insure air-starts. Utilizing the following body tubes, the model scales come out as: Estes BT-50 = 1:17.55; Centuri #8 = 1:18.88; Centuri #10 = 1:16.50. The dimensions on the drawing must be reduced accordingly by proportioning. Pre-fabbed commercial nose cones can be used directly - the Estes BNC-50K, or the Centuri BC-101 (pointed by the builder). Fins cut from 3/32" sheet balsa will suffice for all three scales, since we have no exact data on the thickness of the prototype fins. Fin airfoil is a simple flat wedge with a square trailing edge. Considerable care should be taken with the balance of the model, due to the aft location of the CP of the staged configuration. This CP is within a fraction of an inch of the true CP, as calculated by the Barrowman method. Two to three nose weights are required. It helps if the nose cone and parachute section are made as separate units with the recovery separation at the base of the chute section. This requires a nose cone, a short piece of body tube, and balsa nose block. The use of a turned hardwood nose would eliminate the need for some of the nose weight. The nose probe should be made from small wood dowel, and not from metal! Because of the small fin area on the booster and the more-than-average weight of the MR-1 Meteo model, the use of a Type B3-O engine for the booster is recommended. This bird needs to come off the launch rod with as high an airspeed as possible for stabilization purposes. For restricted area flying, the use of a Type 1/4A.8-0 or, at most, a Type 1/2A.8-0 in the booster can be tolerated, but it should be a heads-up flight. Color scheme, according to Otakar Saffek of Prague and Letectir + Kosmonautica magazine is: Top stage: Silver overall with one red fin; Booster: red overall with one silver fin. Magazine photos (which aren't reproducible herein because of their screening) show no details on MR-1 Meteo and no lettering; they are typical Soviet photos which are just fuzzy silhouettes. News and Stuff: Within a few months, the Second Edition (2nd Stage?) of the Handbook of Model Rocketry should be published. The response of modelers to this complete handbook has been astounding, even to me. As a result, the first printing is almost completely sold out. 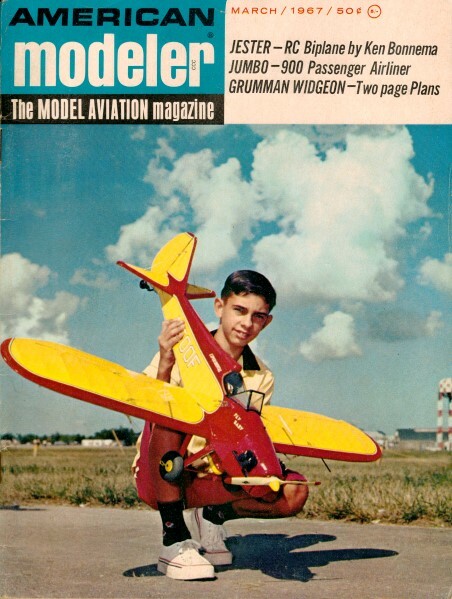 The 2nd Edition was long ago finalized and put to bed, incorporating changes in the photos, drawings, and text to reflect the tremendous progress in model rocketry since it was first published in mid-1965. You wouldn't believe the changes that had to be made! The whole chapter on multi-staging had to be revised, and an entirely new chapter on boost-gliders was written. There were major changes made in the parts dealing with ignition as well as in the section concerned with range operations. And, throughout the book, there were numerous little changes. The Handbook has obviously served a very useful function in another way, too. I brought up a number of questions that had not been answered in model rocketry, a number of problems that had not been solved, and a few things we thought were generally impossible. This was enough to push the Start Button on a couple of modelers. They blasted off to prove that the Old Rocketeer was dead wrong, or stupid, or off his gourd. Lindsay Audin solved the problem of Krushnic Effect (it's just nozzle over-expansion, as he so carefully and completely proved in 1966). Pat Artis proved that parallel staging really worked in 1965, and rammed home his proven ideas in 1966. These are just two of the guys who were bugged by the Handbook. And I am completely delighted. This is the way it should be! I expect you characters to try to take me apart in spades for what I write herein! I must only add that you'd better be careful before you try it, because if you are not right, I will bite. Attention, all Canadian readers! Now, at long last, you've got your own model rocket organization. Thanks to Bill Paris of the Royal Canadian Flying Clubs Association and several other people in Canada the Canadian Association of Rocketry is in operation. Contact the C.A.R. at Suite 207, 2277 Riverside Drive E., Ottawa 8, Ont. Canadians, this is your model rocket group. They've worked hard to get some laws and regulations changed in Canada to permit you to fly, The CAR is affiliated with an FAI aero club and therefore has a direct link to all of the international model rocketry that is now going on.